SpecKROELLchen posted a message on Fastest paragon farming in 4 players setup in S11? they are p 1500+. they done GR118. and runing on wizards! 118 with 3 wizards would be efficient at all. If they did not somehow find a new build. It looks more like a push, also considering the progress bar. This is in fact interesting. for example at like level 24 (see https://us.battle.net/d3/en/item/ring/#type=legendary) you can gamble for mandals with mage. This is an insanre damage boost and you can play T-difficulties. But i have a question too. once the season starts you can do challenge rift right? but how does it distinct between season and non season? Does it apply to the character that i have selected at that moment? https://www.youtube.com/watch?v=mFwGdJxFAsA (depending on your general knowledge if you need that). In general there are tons of videos and guides explaining it and getting the 70 done with the necro should be easy. I didn't test it myself because my group forced me to play WD next season :D, but the links should be fine. So i think i made enough advertisments for the streamers ;D.
Hey its me again ;D. First you need to tell us which class you will start with. If any class is fine it should be very easy with wizard and the standard build, since you already get the 6 piece tal rashas. But in principle if you know your class it should be possible with each class at around 2:00-4:00 am after the season start. This also depends a little bit on itemluck in the first few hours after the start. you will find many primals in time ;D.
when each class has all full speed passives and actives available. I would be careful, imo cains set can still only drop if you are at least level 23. If this can be proven to be wrong, please send a link or something ^^. And Cosmodestroyer is right, no more bonus acts, so just go for A1 since the monster type is not that strong there. I think the overall meta will be very much the same as last season. I have done gr 100+ with a trash-clear-necro which worked fne, but I don't see it replacing the WD by a long shot. For the supports spots I am almost certain that we will see the omnipresent Barb and Monk in 4 man groups, Monk can't be replaced simply put and the barb offers too much utility to swap in higher lvl speed clears. The RG Killer spot will be a season-long contest between the DH, the Wiz and the Necro. Personally I think all three classes are pretty much the same unless you are pushing 120+: all 3 can clear an RG within 3 mins in 110's with ease. With that said I see the Necro coming on top of the other two, but not with the Inarius build. I belive the Trag'Oul corpse lance build will be the strongest RG killer in the game for season 11... I did some testing and it turns out that a 2.5 mil DPS Trag-Corpse-Lance can clear a 105 RG in one rotation... 30 seconds or so. I cannot agree more with your post. That are the same thoughts i have after the experience of last season and the non season necro group tests. SpecKROELLchen posted a message on Druid & Amazon Hybrid - The next DLC? I feel what is missing so far is some Spear or throwing spear weapons (not the barbarian skill) or some more ranged melee weapon that is based on its size and of course shape-shifter with animal forms. So this would be indeed an interesting class. Regarding the bows, I don`t know if the demonhunter doesn`t already fill this role completely but i also feel there could be some additional nice bow skills that do not feel as "machinegunt-like" ;D.
And to agree with OP the idea of a hybrid seems very nice. (I am fully aware that it is very unlickely to expect one more class but speculating is still fun ;D). SpecKROELLchen posted a message on What do you think about the new Challenge Rifts mode? a) give a reward each time you set a personal best (that beat the timer). Since you have to beat your own best time there is diminishing rewards. have multiple challenge rifts available at the same time -- one for each class, each lasting a week, each changing on a different day of the week. This turns them into daily events, but doesn't punish the person who only plays a couple time a week. Support a) . Blizz really needs to add this kind of incentive for people to play this mode more than once a week. a) is a really nice idea. 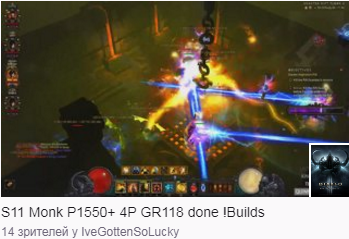 i dont like because it would maybe force people who do not want to play challenge rifts (especially with these builds). I think one per week is nice, if you can get rewards by beating your own timer. getting into it. They had almost one year for challenge rifts. And sorry to put this here but i also think the new rifts are designed horribly. They look really nice but it is like with most of the new areas they don`t fit very well into D3 fast pased playstyle, like too many dead ends, not enough big areays. The fnew greater rift level has the same problems. I am interested in the order of which headrigs gift items are achieved at which stage. Especially for the Barbarian for some testing. Did anyone test it in the ptr? Or is it always the same order, like helm gloves first? I think the next blizzcon will define if D3 goes into maintenance or not. I think the small blizzard team has to first catch up on things like primals (multiple 1000+ post threads on possible changes that didn't get any response), gems in inventory and other "smaller" stuff that has to be fixed that they were not able to do because of the time investment for the necro dlc. Maybe they decide up on how good the necro dlc sells if they put more time into d3. But lets first enjoy 2.6 for a while ;D.
SpecKROELLchen posted a message on So, no banwave this season? The ban threads at the end of each season are a MUST. We will never stop "whining" (lol) until the last botter has been kicked (what is of course not possible). And I cannot pay respect to people who encourage any form of cheating in any game. I can still not believe how people can openly defend botting and not feel ashamed. I have to clarify things again since some people here were confused even though it was said before. Don`t tell others "scroll lown the leaderboards there were people banned", when you don`t know what is going on. If you clear a GR and you are in the leaderboards with the team, but the team member clears a higher GR with another team, he will not be listed in your team. This is good because otherwise you would see one person like 10 times on the leaderboards depending on how teams he would join. I think that blizzard did not ban this season was stupid. Now that it is too late and nobody cares about the leaderboards of "last" season, they should at least ban two times this season. SpecKROELLchen posted a message on S11 - What character will you be playing? I think the number of necros will be a little bit lower because we have like 3 weeks to test it non season. Finally it will be like 50% necros, also depending on the meta development, which is still too much :D.
The question is: What do you want to accomplish with that? It is alway nice if you want to add something to the community. But there are tons of guides with much, much more details than what you have written. So there would be two options for you. But i think what you posted was just a timewaste for you. The necro still overshines the other RG killers. And despite their post, i think this is just because of $$. We had a nice competition between DH and Wizard last season. the necro will even be stronger. The main problem is this infinite, stricken-like damage increasing necro item that should not exist imo.